Hi guys! It's Saturday and that means another pair of cards with The Alley Way Stamps:) Apparently I was in a very CAS mood when I made both of these cards, a flowery CAS mood:) My first card today features stamps from Petal Pushers. The flower is heat embossed in clear and ink is blended over it. The flowers are all various sizes, but they are all cut from the same original stamp. Underneath I added a vellum vase with stems drawn with a copic. My second card is a holiday poinsettia card stamped with snowflakes from the bonus Holiday Sparkles set. 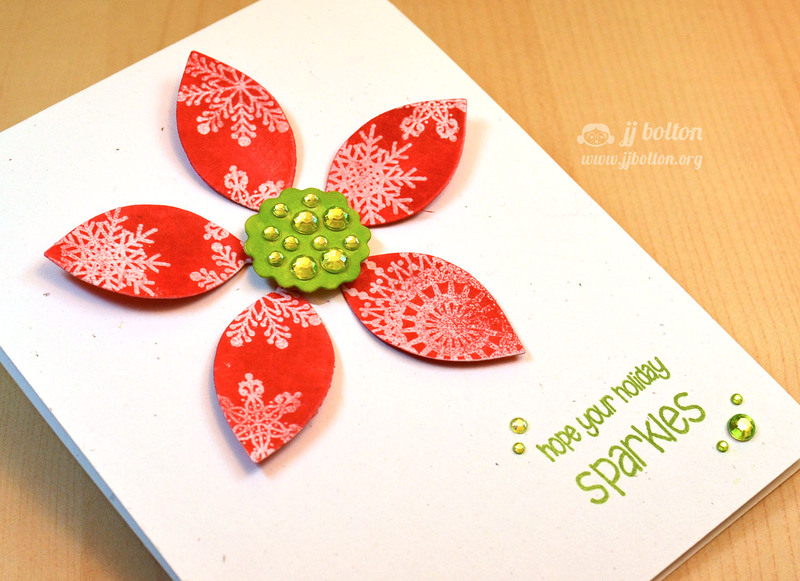 After die cutting the flower shape, I heat embossed the snowflakes and then blended red ink over it. For natural items like flowers, leaves, sky backgrounds, I prefer to use a blended ink for color rather than use solid cardstock. The color has more depth and seem more natural. I bent the petals a bit so that they lift off the card. Finally, a little bit of bling (okay, a lot!) and a sentiment! So easy! As always, I thank you so much for stopping by! 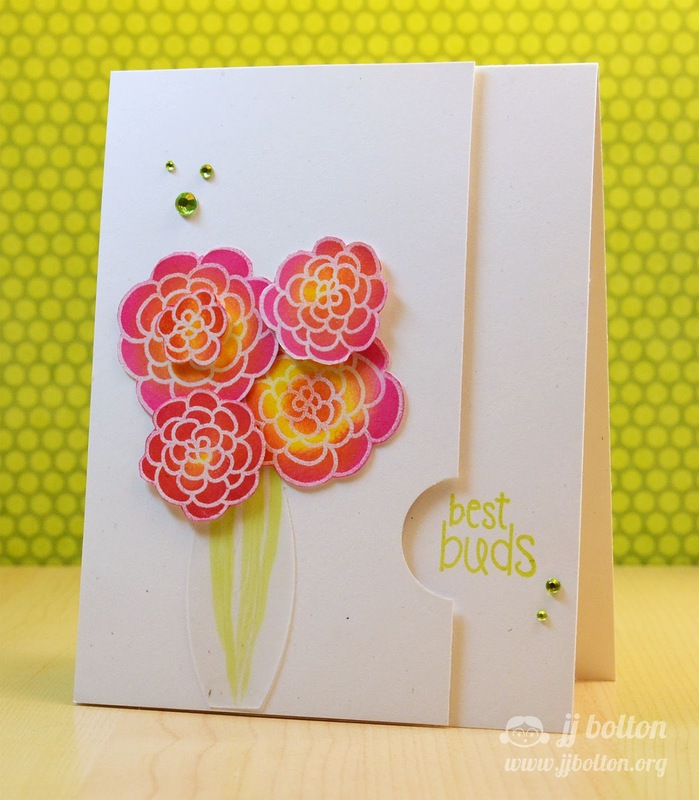 And go check out the The Alley Ways Stamps blog! Those gals are always up to something fun! These are beautiful!! I especially love the poinsettia card! Congratulations on all your good news and successes in this industry. 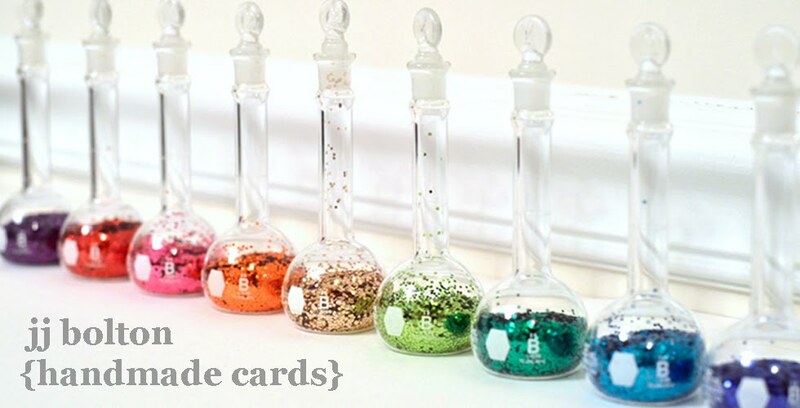 Your cards are phenomenal, not only today but with everything you showcase! neat idea to stamp snowflakes on the petals (mental note taken) and the bling is in all the right places! Gorgeous cards JJ, especially that second one, LOVING how that turned out! You rock SO MUCH at using your stamps to the mostest! Love the flowers in the vase :) And your inking always looks gorgeous :) Love all the bling (who, me? lol) and the snowflakes on the poinsettia petals? GEEEEENIUS! these are SO GORGEOUS, JJ! love them! I love getting ideas from you ... cutting down a larger flower is genius!! You have a whole bouquet with just one stamp. And your advice on inking the paper ... you're right, it has so much more depth! Thanks!!! Awesome first card JJ, but it's the second one that took my breath away - wow!